Contact us at (302) 738-2267 to learn more about our dog grooming services. Please Note: We do baths and nails all days except Easter, July 4th, Thanksgiving Day and Christmas Day. 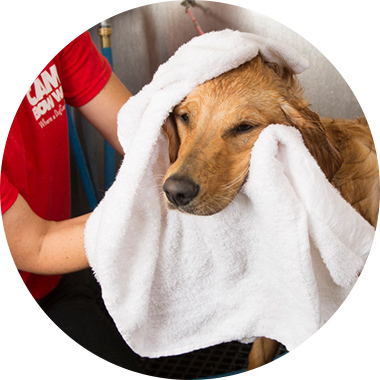 We have general availability for baths, bath/blow-dry/brushouts and nails; so just ask at drop off and your pup will be ready at pick-up. If it is just before a major holiday a bath reservation is suggested. Owners wanting full grooms (includes a trim) should call Camp between 9am and 4pm to check groomer availability and make reservations. Dog Weight: 15 lbs or less. Includes: Professional trim after bath, brush, blow dry, nails & ears. Reservation required for full groom. Dog Weight: 30 lbs or less. Includes: Professional trim after bath, brush, blow dry, nails & ears. Reservation required for full groom. Dog Weight: 30-45 lbs. Includes: Professional trim after bath, brush, blow dry, nails & ears. Reservation required for full groom. Dog Weight: 45-80 lbs. Includes: Professional trim after bath, brush, blow dry, nails & ears. Reservation required for full groom. Dog Weight: 80 lbs or more. Includes: Professional trim after bath, brush, blow dry, nails & ears. Reservation required for full groom.